Who is the current leader of the Republican Party? No one. But there certainly is someone who wields the most influence over people who agree with the Republican Party platform, and that is Rush Limbaugh . How so? 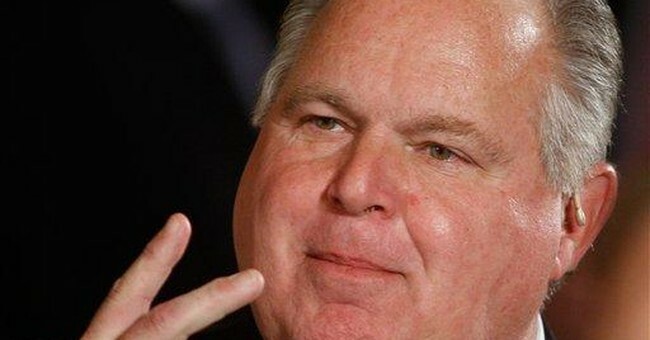 Because Limbaugh manages to do the three things any leader must do to be successful with a large group of people: he communicates direction, he earns trust, and he evokes desire in people to go in the direction he communicates. Those are the three fundamentals of leadership. Direction is the essence of leadership. You can’t lead anyone anywhere if you don’t communicate a clear direction. Who in the Republican Party has been communicating clear direction—a direction that is consistent with the Republican ideals of limited government, fiscal restraint, and the protection of life, liberty and self-evident moral values? No one prominent comes to mind. Yet this has been Limbaugh’s consistent message for over twenty years. The second fundamental of leadership is trust. Even if you communicate the right direction clearly, people will be reluctant to follow if they don’t trust you. Limbaugh has a vast audience that trusts him because he consistently asserts and explains conservative principles. Fewer people trust Republicans these days because about all most of them can be trusted to do is to defy those principles. The platform declares that the party intends to “constrain the federal government.” Who in the party effectively communicates this and then follows through? With apologies to Senator Coburn, no one prominent. While President Bush thankfully accomplished his most important priority—keeping us safe—he and his fellow Republicans spent like Democrats for eight years. If you can’t trust Republicans to govern as Republicans, the only motivation to vote is negative—“they probably won’t be quite as bad as Democrats.” Is it any wonder why millions of conservatives stayed home in 2008? The third fundamental of leadership is desire. Followers can know your direction and trust you, but little will be accomplished if you can’t evoke in them a passionate desire to go in the direction you’ve set. This is where Limbaugh excels. Many in his loyal audience of 22 million (more since being singled out by the Obama Administration) say that Rush articulates what they think. In addition to his humorous, direct, and some say, “incendiary” attacks on liberals, Limbaugh often sounds like a motivational speaker declaring that all can succeed in America, especially when we get government off our backs. Republicans seem too afraid to upset the media by championing this conservative direction for America—a winning direction that a majority of Americans actually desire. According to the oft-repeated bipartisan battleground poll, more Americans identify themselves as conservatives (60%) than liberals (38%). Moreover, the massive commercial success of Limbaugh’s show and conservative talk radio in general is additional evidence that the conservative direction is desirable when articulated properly. Unfortunately, too many Republicans ignore these facts and the lessons of Reagan. They somehow think that Democrat-lite is their ticket to electoral popularity. It’s not—articulate conservativism is. As the 2008 election showed us, when Republicans offer neither, voters will settle for articulate. Which leads us to where we are today. We have an articulate president whose direction is clearly wrong for the country. That’s not just an opinion. Obama’s direction is demonstrably wrong because it ignores the repeated lessons of history and adopts a false view of human nature. Socialism has never worked and will never work because it destroys human incentive and creates dependency. Limbaugh says that Obama knows this and wants to create a culture of dependency that will keep Democrats perpetually in power. If this is true, Obama is taking a leadership page from Joseph Stalin. While speaking to a group of henchmen one day, Stalin began denuding a chicken that struggled to get away. After Stalin finished the painful process, he placed the now-vulnerable bird at his feet and walked away while dropping breadcrumbs behind him. To everyone’s surprise, the bird he had just tortured followed the dictator around the room. The moral? Stalin gave it: “This is the way to rule the people,” he said. “Did you see how that chicken followed me for food, even though I had caused it such torture? People are like that chicken. If you inflict inordinate pain on them they will follow you for food the rest of their lives." Indeed, if you don’t want to be bothered with getting people to actually desire your direction, you can rule through pain and fear. Vulnerable chickens will follow. So despite socialist ideas proven to fail, too many chickens are fearfully following Obama off an economic cliff into a debt-ridden welfare state. This is folly! The only way recover lost wealth is to create more wealth. And the only proven way to do that is to incentivize the private sector by cutting tax rates. The government—which creates no wealth—certainly can’t spend our way out of bankruptcy! •	Unprecedented debt and dependency will crush lives and incentive for generations to come. For the sake of the country and our future, let’s hope Obama fails in these areas. I pray for the President, but I also pray that articulate conservatives in politics will begin to lead like conservatives in talk radio.